Last month, defense attorney George Lyon picked up the type of case that doesn't really make the news. His client had been arrested in Northeast D.C. while visiting friends in her old neighborhood, and charged with possessing an open container of alcohol. "So I said, 'Well, were the officers wearing body cams?' And she said yes. And I said, 'Well, then let’s get the body cam evidence and see what it shows.' So I asked the prosecutor for the body cam evidence, and it took about a week to get it," says Lyon, who works with Virginia-based Arsenal Attorneys. “You can see from the video it wasn't sitting by her at all," Lyon says of one of the alcohol containers police alleged she was drinking from when she was arrested. "So you wonder, why did my client get charged? And apparently she was unhappy with the situation and was saying something to the officer. At minute nine in the body cam tape, he says, 'Do you have an attitude?' And she says, 'Yes, I have an attitude.' Which prompted him to arrest her for having an attitude and charging her for something that she didn’t do," he says. The charge against Lyon's client, who he declined to name to protect her privacy, was dropped. Police forces across the country are outfitting officers with body-worn cameras. In D.C., some 1,300 police officers are already using them, and by the end of the year that number is expected to grow to 2,400. The rationale for the cameras has always been that they'll offer an objective record of what happened, providing a tool for holding police accountable and rebuilding trust with communities that have grown distrustful of police. And with the sheer number of cameras now in use in D.C. — and the amount of footage they collect — that means more of it is filtering into run-of-the-mill criminal cases like the one involving Lyon's client. "We're starting to get it in a lot of cases now," says John Copacino, who directs the Criminal Justice Clinic at the Georgetown University Law Center. Copacino says one of the biggest benefits of the footage — in cases big and small — is that it minimizes the reliance on he-said, she-said testimony that can often be unreliable. "Before, everything was dependent on witness testimony, either from the police or eye witnesses or defendants," he says. In many cases, he says, the cameras can help police and prosecutors, especially when a decreasing trust in police could affect a jury's willingness to convict. Research has also found that the cameras can simplify an officer's job. In the United Kingdom, officers using the cameras experienced a 22 percent decline in officer time devoted to paperwork and a 9 percent increase in time spent on patrol — roughly 50 more minutes over the course of a nine-hour shift. Copacino says one of the challenges defense attorneys are facing is getting access to the footage. While D.C. law allows someone who is charged with a crime to view body-worn camera footage in preparation of their defense, prosecutors are allowed to screen and redact the footage. "They believe that they need to screen their videos for privacy. They're feeling their way on how to do that now," says Copacino. In a case he's taking to trial today, he got three hours of footage — yesterday. "[Prosecutors] asked for blanket protection order in the use of the body-worn camera video, and we're not agreeing to those. But as a result of their being behind on this stuff, we're getting things right now very late." And there's an additional challenge the emerged in the wake of the police-involved shooting of motorcyclist Terrence Sterling last month: the D.C. police officer who shot Sterling only turned on his camera after firing his gun, leaving no video record of the circumstances that led up to the fatal incident. 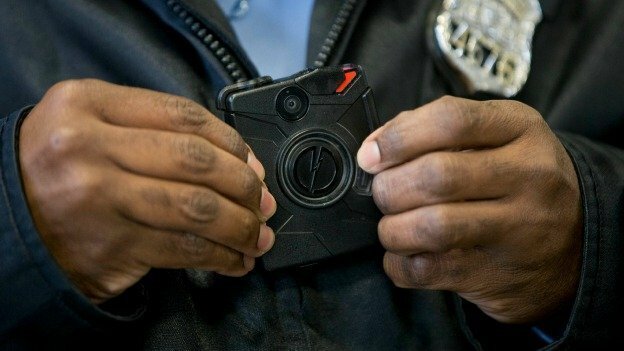 The office of the U.S. Attorney for D.C. — which prosecutes most crimes in the city, though not minor charges like open container, which is handled by the D.C. Attorney General — says prosecutors haven't used body-worn camera footage in many cases yet. Copacino says the technology is early in its adoption phase, and he expects footage to play a bigger role in more cases as the years pass. As for Lyon's client, he says that while her charge was minor, she knew she hadn't done anything wrong. Even with an offer to take a guilty plea and accept only the time already served — a night in jail — Lyon says his client wanted to fight the charge. “Was this a big case? No, not a big case at all," he says. "But she wasn’t about to take a plea of guilty when she said she was innocent and the evidence proves it." Professor Somin teaches constitutional law and property. He is also a scholar of the CATO Institute and a frequent blogger for the Washington Post’s Volokh Conspiracy. He has testified before the US Congress twice: once on the subject of drone warfare and once on the subject of Sonia Sotomayor's record on property rights, during hearings for her nomination as a Supreme Court justice. Professor Somin has been featured in the New York Times, the Wall Street Journal, USA Today, CNN, National Review, Forbes, Los Angeles Times, and the Daily Caller. He is the author of The Grasping Hand: "Kelo v. City of New London" and the Limits of Eminent Domain, which expands on his work on property rights. He is co-author of A Conspiracy Against Obamacare: The Volokh Conspiracy and the Health Care Case. Professor Somin is also co-editor of Eminent Domain in Comparative Perspective. Ilya Somin was born in the Soviet Union, where his family were subject to material poverty and political indoctrination. At age 5, his family emigrated to America. To purchase a copy of "Democracy and Political Ignorance" at a special discount, contact Arsenal Attorneys at 703-291-3312. The government of the District of Columbia confirmed it will not enforce its stun-gun ban against three residents represented by Arsenal Attorneys’ George Lyon. Our clients, a political blogger, a nurse and an armed-robbery victim, challenged the stun-gun ban as an unconstitutional infringement of their Second Amendment rights. Additionally, the DC Council has signaled it will voluntarily repeal its stun-gun ban, albeit under pressure from our clients’ lawsuit. The litigation of this case has halted for 90 days to allow DC to enact the legislation necessary for the repeal. An excerpt from a report on this case by Washington Times reporter Andrea Noble follows. D.C. lawmakers are moving to repeal a ban on ownership of stun guns after residents challenged the law’s constitutionality in a federal lawsuit. Attorneys representing the city agreed this week to a stipulation that allows the three D.C. residents who filed the lawsuit to obtain and possess Tasers in their homes. The lawsuit will be placed on hold while the D.C. Council considers legislation that would make it legal for residents to possess and carry stun guns and also do away with the city’s requirement that people register pepper spray with the Metropolitan Police Department. 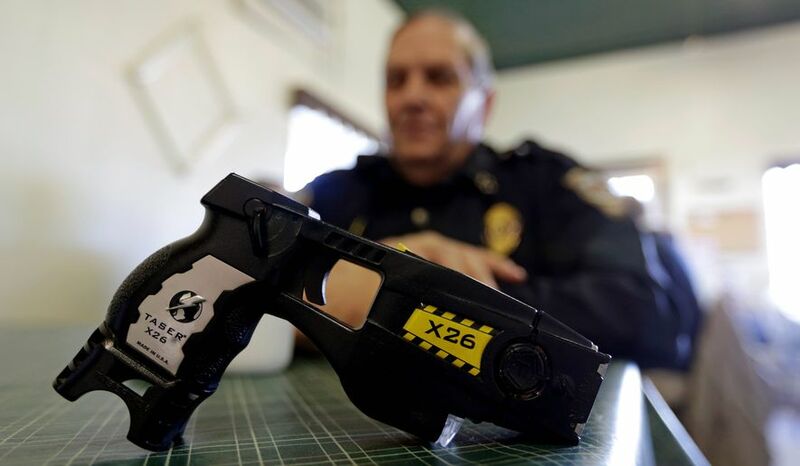 Stun guns are banned in five states as well as numerous cities and municipalities, though such laws are likely to come under increased scrutiny as Second Amendment supporters broaden their attacks on regulations that limit self-defense options. Attorney George Lyon, who is representing the three residents challenging the law, filed the lawsuit this summer after a U.S. Supreme Court ruling brought into question the legality of a Massachusetts ban on stun gun ownership. D.C. Council Chairman Phil Mendelson agreed with the assessment and introduced legislation to do away with the city’s stun gun ban on Sept. 20. “We have a complete ban on stun guns right now, and I think it’s reasonable to expect that the ban would not hold up,” Mr. Mendelson said. A spokesman for D.C. Attorney General Karl Racine declined to discuss the reason why the city opted to pursue legislation over litigation, noting that the lawsuit is still pending. As part of the agreement, the District admits no liability or wrongdoing, and the three plaintiffs in the case — a conservative blogger, an armed robbery victim and a nurse who works night shifts — will be allowed to obtain and possess Tasers at their homes while the legislation is debated. “The city made no attempt to defend the constitutionality of the law,” Mr. Lyon said. Legislation introduced by Mr. Mendelson and Kenyan McDuffie, chairman of the D.C. Council’s Judiciary Committee, would make possession of a stun gun legal to those over the age of 18 and use of the devices legal only “in the exercise of reasonable force in defense of person or property.” It also would require venders who sell more than five stun guns or self-defense spray canisters a year to register with police. As it’s currently written, Mr. Lyon said he would not have any objections to the proposal. “If the bill is substantially restricted, we will have something to fight about,” the attorney said. As the bill works its way through the legislative process, Mr. Mendelson said he’s unsure whether D.C. police or the city attorney general will “be comfortable” with the current draft or suggest changes. The District’s firearms laws are considered among the strictest in the country, with gun owners required to register their weapons with police and take training courses. To obtain a concealed carry permit, handgun owners must demonstrate a “good reason” in order to qualify. The Supreme Court’s March ruling did not overturn the Massachusetts ban on stun guns outright. But Second Amendment advocates say it did lay the groundwork for challenges to other bans of nonlethal items meant for self-defense. The ruling rejected the arguments invoked by the Supreme Judicial Court of Massachusetts, in which judges ruled that stun guns were not protected under the Second Amendment because they “were not in common use at the time of the Second Amendment’s enactment.” The case was sent back to the lower court, where the charges were eventually dropped. 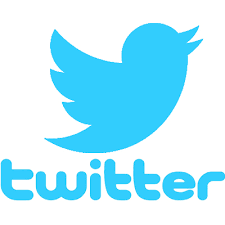 Follow Arsenal Attorneys on Twitter! Follow Arsenal Attorneys on Twitter. WASHINGTON, DC, AUG. 2, 2016--Today Arsenal Attorneys™ filed a suit in the US District Court in Washington, DC on behalf of three plaintiffs challenging the District of Columbia's ban of Tasers® and other non-lethal electronic arms. The plaintiffs are asking the court to declare DC’s ban on non-lethal electronic self-defense devices unconstitutional in violation of the Second Amendment. A successful outcome for the plaintiffs would likely to lead to repeal or challenges of similar anti-self-defense laws in other jurisdictions. Several states currently ban possession and/or carry of electronic arms, including New York, New Jersey, Rhode Island, and Hawaii. In addition, a number of municipalities ban electronic arms, including Baltimore City and County and New Orleans, and various smaller cities across the country. Arsenal Attorneys™ filed their clients’ case, Wright v. District of Columbia, against the District of Columbia and Metropolitan Police Department Chief Cathy Lanier. An application for a preliminary injunction will be filed as soon as the defendants are served. The lead plaintiff is Crystal Wright (pictured), a public relations professional, political commentator and author. Ms. Wright publishes a blog entitled “Conservative Black Chick.” She is also author of the newly released book by Regnery Publishing titled "Con Job: How Democrats Gave Us Crime, Sanctuary Cities, Abortion Profiteering, and Racial Division." Court documents recite that Ms. Wright has been cyber-stalked and threatened for her outspoken political beliefs. Another plaintiff is Brendan Turner, who has twice been robbed at gunpoint in DC. The third plaintiff is Traci Dean, a nurse who often works late hours. All three plaintiffs want a Taser® to protect themselves in appropriate circumstances. Each applied to Taser® International to purchase a Taser® Pulse model and were denied based on DC law which prohibits a Taser® or stun gun just the same as an explosive like a grenade. Ms. Wright originally considered a firearm for self-defense; however, the District of Columbia’s restrictive gun control laws made that a difficult and long process. Her parents suggested she obtain a stun gun as a short term, non-lethal solution. They were shocked when her attempt to purchase a Taser® online was barred by DC law. According to Mr. Lyon, his clients’ case became stronger following a US Supreme Court decision in March reversing a Massachusetts conviction for possession of a stun gun on Second Amendment grounds. In that case, Caetano v. Massachusetts, the Supreme Court held that the state court’s decision affirming the conviction was inconsistent with the Supreme Court’s decision in District of Columbia v. Heller. Massachusetts ultimately dropped the charge against the defendant rather than defend its prohibition on stun guns. D.C. currently classifies Tasers and stun guns as “destructive devices” the same as bombs and poison gas. Attorney Lyon called that classification “nonsense, given that Tasers are not designed to kill or cause permanent injury.” He explained, “A Taser is designed to temporarily incapacitate an assailant so the intended victim can get away and call the police. Police use these devices every day to subdue suspects without significant injury. The U.S. Justice Department has stated that police use of Tasers decrease injuries to both suspects and officers. Ordinary citizens should have access to this self-defense tool for the same reasons.” According to the Taser website, some 18,000 law enforcement agencies are equipped with the device and more than 275,000 Tasers have been sold to the public. Attorney Lyon understands these issues first hand. He is a DC resident, and he was one of the original plaintiffs of the Heller v. District of Columbia, in which the Supreme Court held in 2008 that the Second Amendment guarantees an individual's right to possess a firearm for self-defense within the home. Lyon was also a plaintiff in Palmer vs. District of Columbia, in which the DC Federal Court overturned DC’s complete ban on the carrying of firearms outside the home in 2014. In addition to his law practice, Lyon is a certified firearms instructor and self-defense expert. He regularly helps clients with gun ownership and carry permits in the District of Columbia, Maryland, and Virginia. The following was first published with our permission by 'The Truth About Guns', one of the most popular online sources for firearm issues. We in the defensive firearms training community are forever urging our students to make a plan and practice the plan. But who practices drawing from a purse while soaking wet and naked? 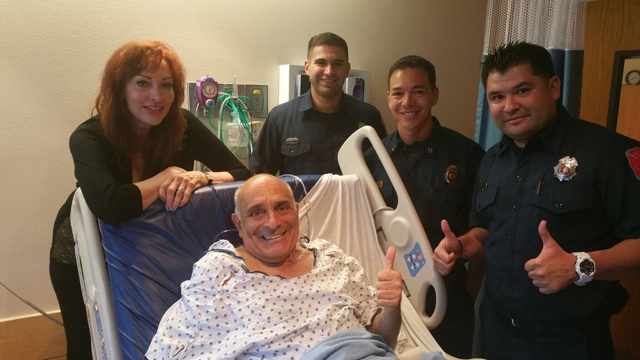 It will soon be a year since Lynne Russell and her husband Chuck de Caro were just looking for a dog friendly place to stay for the night (Russell is pictured at left comforting the bed ridden de Caro and their their emergency responders). The two former CNN newspersons were traveling from the Washington, DC area to Los Angeles with their 13-year-old dog, Oliver and decided to follow the legendary Route 66. They had stopped to have dinner in Albuquerque, New Mexico with friends. Lynne is most well known as the first female network nightly news anchor, having spent 18 years anchoring CNN’s headline news from 1983 to 2001. Few people know she is a licensed private investigator and once served as a sheriff’s deputy in Georgia. Chuck served with the 20th Special Forces Group (Airborne) prior to a career as a special assignments correspondent for CNN. He currently is a national security consultant and veteran of the Special Forces. They both hold carry permits from their home state. Their route allowed them to carry their personal protection handguns almost their entire trip up to the California state line. 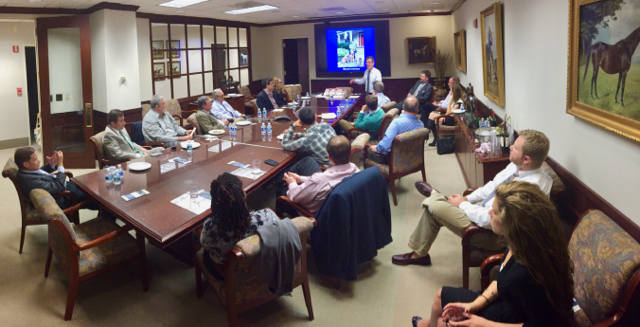 I recently had the pleasure of providing them the 18-hour District of Columbia Concealed Pistol License course, during which we discussed in detail the events occurring that night in Albuquerque. After their dinner with friends, Lynne and Chuck had limited options for lodging in Albuquerque. Needing some place that would accept their pet, they thought Motel 6 had left the light on for them. What they didn’t know is that this Motel 6 they chose had been the scene of hundreds of police responses over the preceding several years. It was a frequent location for prostitution, drug deals, and other crimes. The City of Albuquerque had previously threatened to take action against the motel, prompting the establishment to install 32 surveillance cameras and to employ a security guard. On the night in question, however, the security guard was on an extended personal phone call, and no one at Motel 6 was monitoring the security cameras. Thinking they were in for the night, Chuck and Lynne took off their carry guns and placed them on a table beside one of the beds. Chuck then headed to the bathroom to take a shower. Lynne needed to feed the dog, but had left the dog food in the car. She went out to the car to get the dog food. There she met Tomorio Walton, who apparently was in violation of his parole from a 2010 Tennessee aggravated robbery conviction. Walton had been convicted for robbing a woman at gun point as she was walking to her apartment. Walton asked Lynne for a cigarette as she walked to her car. “I don’t smoke,” she replied. The suspicious Walton made her Spidey sense tingle, but when she looked back at him, he had disappeared. Motel 6 video cameras show that Walton had secreted himself around a corner and as Lynne returned to her motel room, Walton grabbed her and pushed her into the room with enough force that she ended up sprawled on one of the beds. At that instant Chuck came out of the shower naked and wet looking for a towel. He saw Walton sending his wife flying through the air backwards. As she crashed on the bed, Chuck yelled, “What the hell is going on here!” He thought she was going to be raped. Walton quickly leveled a gun at Chuck and said “I need your money” and concocted some story that his girlfriend had been kidnapped. The couple were carrying very little cash, however. Seven long minutes of negotiation then proceeded about whether they had anything of value to give the robber. All the while, Walton was waiving a semi-automatic handgun at Lynne and Chuck. Lynne explained to me she was convinced Walton was going to kill them after he got what he wanted. Chuck explained to me that he thought about whether he could shoot through the purse, but was concerned whether his semi-automatic handgun would malfunction so he knew he had to draw the gun from the purse to shoot. Walton by this time had grabbed Chuck’s laptop computer, headed for the door, then turned and opened fire on Chuck. Chuck drew his gun from the purse and returned fire. He advanced on Walton in a combat crouch while yelling a battle cry of the US Army Rangers. His military training from four decades earlier had automatically kicked in. In what Chuck thinks was no longer than four seconds, both men emptied their guns. Three of Chuck’s seven .380 FMJ rounds were stopped by the laptop Walton held. The remaining four rounds struck Walton who then threw his empty gun at Chuck, ran out of the motel room and collapsed in the parking lot where he soon died. Chuck took a through and through round to the abdomen, another shot to the abdomen that is still in his body, and a hit to the leg. As he lay rapidly bleeding on the motel room floor, he chanted repeatedly, “call 911, compress the wound, elevate my feet, give me fluids.” Miraculously, the robber’s shots missed anything vital though Chuck is still recovering a year later after multiple surgeries. Second, don’t assume a nationwide chain of lodging establishments are safe and don’t assume anyone is monitoring the security cameras. Lynne and Chuck have now learned that there have been serious problems with Motel 6’s around the country, not just the one where their incident occurred, and several have been shut down. They are suing Motel 6 and the company that provided the security guard who was distracted from the incident by a lengthy personal phone call. Third, Lynne was attacked during a period of transition when her attention was focused on opening the motel room door. Moments of transition are periods where we are most vulnerable due to task fixation. It is important to heighten our awareness during those periods and be sure our environment is safe. Fourth, mindset prevailed. Chuck had the warrior mindset that he was going to protect who he calls “the girl of my dreams” at all costs. He drew while at gunpoint himself, closed on the attacker, and won the gun fight despite taking multiple rounds. Fifth, Chuck ended the threat with relatively weak .380 FMJ rounds fired from a small handgun. The assailant was shooting hollow points, also .380, but most of them missed Chuck and Lynne. Good shot placement took out the attacker. Sixth, if it comes down to it, an object like a laptop computer might offer some cover to protect vital areas of the body. Seventh, take a trauma medicine course with your travel companion and have on hand with you a minimum blow-out kit: a tourniquet, pressure bandages, and a hemostatic agent such as Quikclot™ or Celox™. Lynne only had the motel’s towels to try to stop Chuck’s bleeding. Eighth, don’t expect the fight to be cost free. From a legal standpoint, this was a black and white self-defense shooting; however, Chuck was shot and has a long period of rehabilitation. Police took their guns for evidence. Their dog was so traumatized he had to be put down. Lynne and Chuck now fear retribution from Walton’s accomplices who appear to have gang connections. Attempted murder charges against the assailant’s cohort, have been officially dropped because the main witness has disappeared. Hence, the need for the District of Columbia carry permits. By the way, both passed their shooting qualification and are the 75th and 76th persons to receive carry permit licenses from the District of Columbia. George L. Lyon, Jr, Esq. is an attorney licensed in Virginia and the District of Columbia, and he practices law with Arsenal Attorneys™, a national law practice. Mr. Lyon was one of the initial plaintiffs in the US Supreme Court’s landmark Second Amendment case, District of Columbia v. Heller. He was also a plaintiff in Palmer v. District of Columbia, which last year forced DC to begin issuing carry permits to residents and nonresidents. Mr. Lyon is one of the few firearms instructors certified by DC Metropolitan Police Department to provide the required training for DC carry permits. He can be reached at arsenalattorneys.com. This article is written for general educational purposes only. It does not offer legal advice or an attorney-client relationship. Arsenal Attorneys™ serve clients in 40 states. Always seek legal advice from a licensed professional attorney in your state.